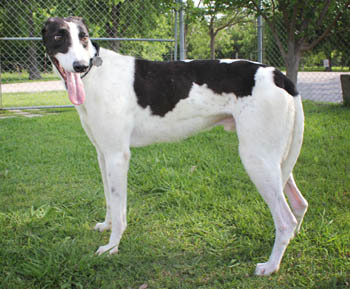 Jet is a 2½-year-old white & black male born November 2, 2009. He is the only one of his litter not individually registered with the NGA. His sire is Yo My Mediator and his dam is MRL Latta. Being unregistered, Jet has no racing record. He arrived at Fort Worth Animal Care & Control as an owner surrender with Mason. 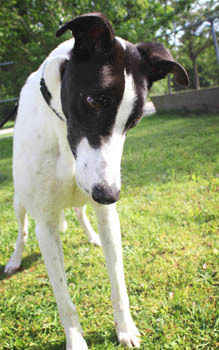 This handsome boy is waiting to meet you! Jet has passed his initial cat test - he is cat trainable.